Mongolian ‘Wind from the Grass..
ATLANTA — Middle Tennessee State University unveiled Wednesday a Regional Scholars Program that will provide incentives for select potential out-of-state freshmen who live within 250 miles of its Murfreesboro campus. The program, which will reduce MTSU’s out-of-state tuition by 48 percent, will be offered starting in Fall 2016 to students with an ACT composite of 25 and above. 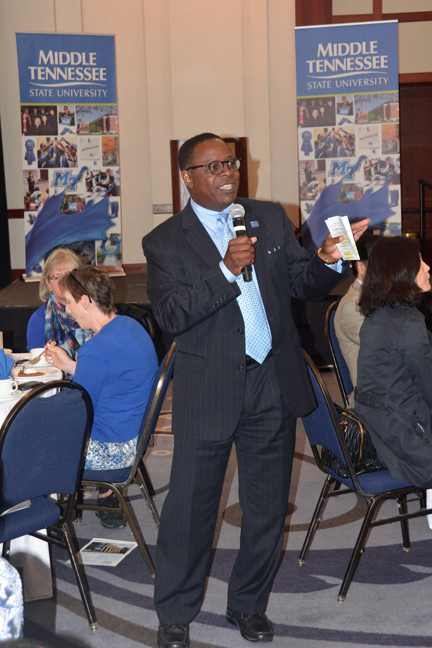 President Sidney A. McPhee made the announcement at an Atlanta luncheon with area guidance counselors and MTSU alumni. Atlanta was the second stop of the 2015 True Blue Tour, the first of three out-of-state venues for the admissions event. Program scholars will also be eligible for MTSU’s guaranteed academic scholarships and given consideration for entrance into the university’s Honors College. McPhee said the program, which goes to the Tennessee Board of Regents for final approval in a few weeks, would remove some of the obstacles that may discourage strong applicants who live close to the state. “With more than 140 undergraduate degree options, in programs that have gained national and international recognition, MTSU is a great choice for potential freshmen inside and outside the borders of Tennessee,” he said. Potential scholars must apply for admission to MTSU by Dec. 1 in order to be considered for any additional guaranteed academic scholarships. Go to www.mtsu.edu/scholarships for more information. McPhee and the True Blue Tour will also travel outside Tennessee to Huntsville, Alabama, on Nov. 4 and Bowling Green, Kentucky, on Nov. 11. The tour’s trek across Tennessee included Chattanooga on Sept. 29 and will resume with stops in Johnson City on Oct. 19, Knoxville on Oct. 20, Nashville on Oct. 22, Memphis on Nov. 9 and Jackson on Nov. 10. The Regional Scholars Program will become the second incentive offered by MTSU to out-of-state students who live near Tennessee. The university is also a member of the Academic Common Market, which allows residents of participating states to qualify for in-state tuition for unique academic majors not offered in their home state. The market is open to potential students in Alabama, Arkansas, Delaware, Georgia, Kentucky, Louisiana, Maryland, Mississippi, Oklahoma, South Carolina, Texas, Virginia and West Virginia. It is limited in Florida and Texas to graduate students. Go to www.mtsu.edu/acm for more information.